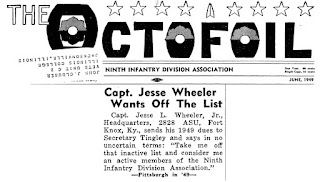 Capt Jesse L. W-H-E-E-L-E-R was born in Virginia in July of 1922. 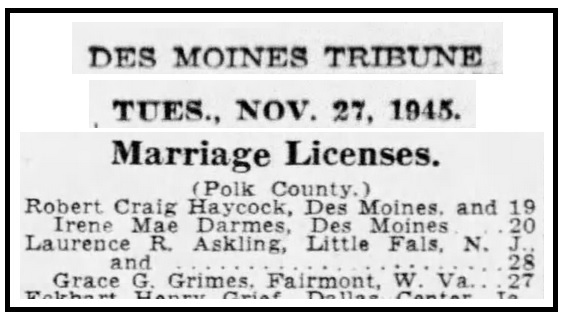 He was commissioned in July of 1943. 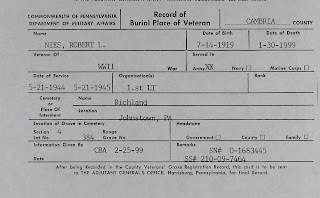 He served in the 39th Infantry Regiment in the 9th Infantry Division. He rose to the rank of Colonel having served in the Vietnam war as well as an advisor. 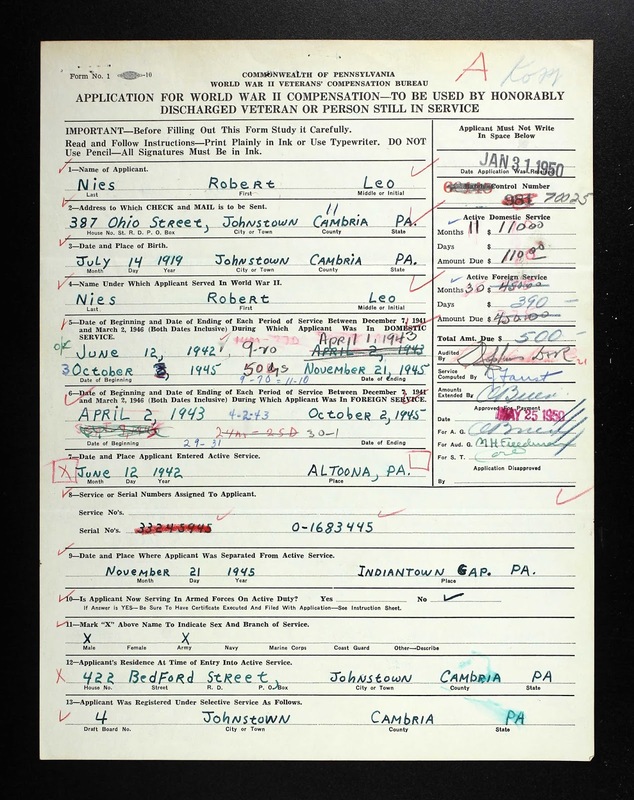 During WWII he was awarded the Silver Star Medal (H.Q 9th Infantry Division G.O. No. 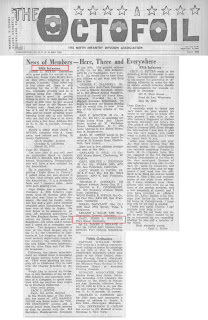 7, 1945) and 2x Purple Heart Medals. 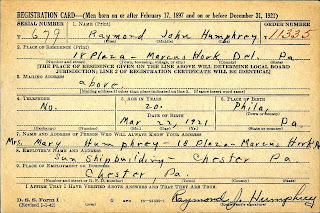 Capt Raymond J. H-U-M-P-H-R-E-Y was born in Philadelphia, PA in 1921. 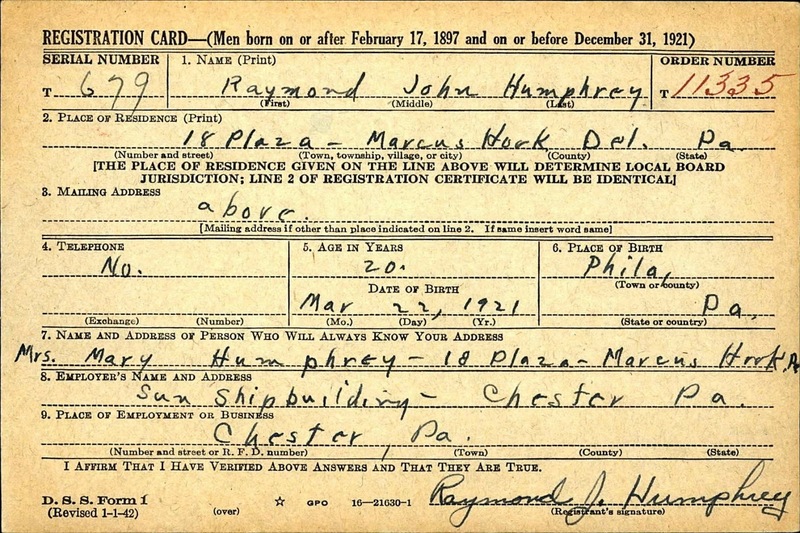 He enlisted in the Army in 1942. He attended basic training, served a little over a year as an enlisted Infantryman and was then commissioned at Ft. Benning, GA in 1943. 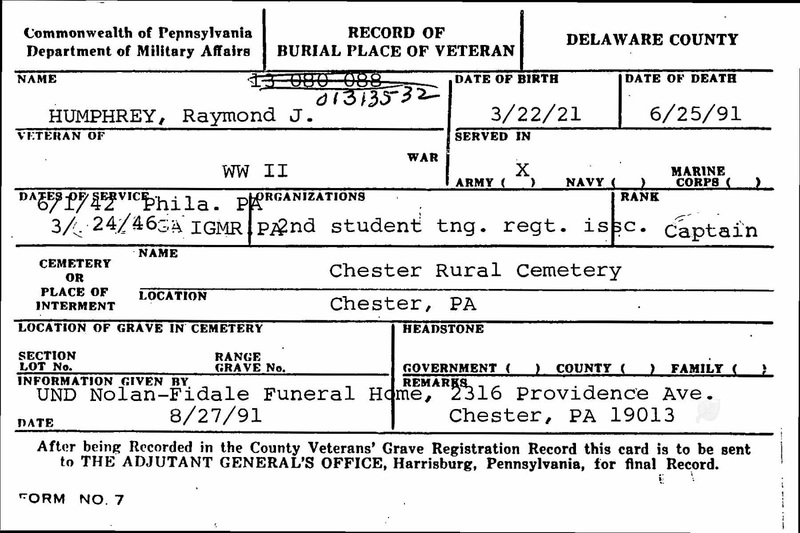 He was then assigned to the 160th Infantry Regiment in the 40th Infantry Division. 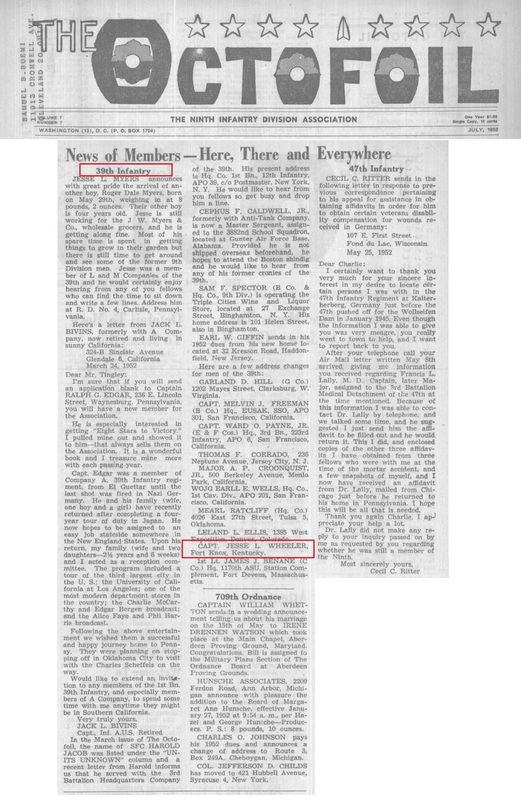 Per the veteran's son "Capt H saw action as a Weapons Platoon Leader (Mortars), Company Executive Officer and ultimately, Company Commander. 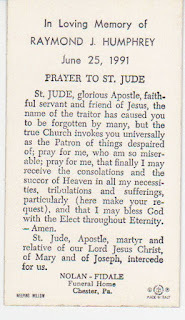 He saw action in the Solomon Islands, New Guinea, Papua, New Britain and Luzon, Philippines. 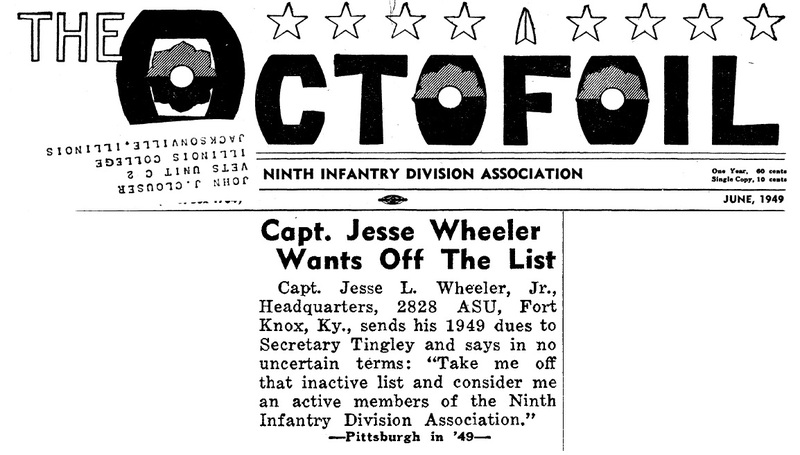 His unit was on troop ships preparing for the invasion of Japan when the atomic bombs ended the war. His awards included the CIB, Bronze Star and a Purple Heart." He was married in October of 1946 and spent his remaining years in Wallingford, PA. He passed away in June 1991 and his wife passed in 2003. 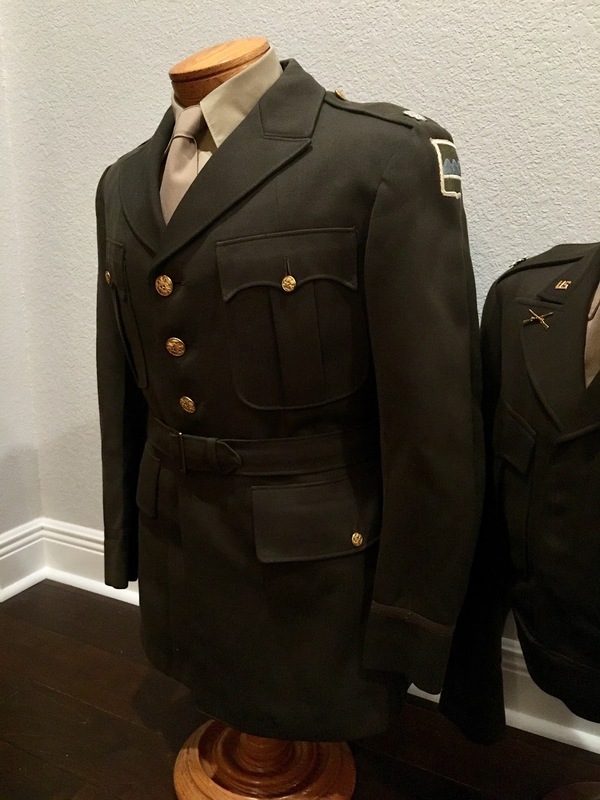 This uniform came directly from the son who was a decorated Cavalry Officer in Vietnam himself. 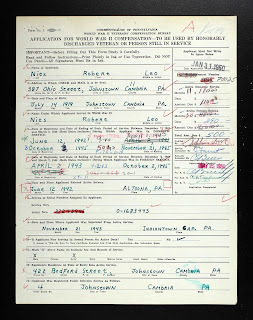 The son is currently looking for wartime photos and his documents, so please stay tuned and check back from time to time as it may just keep getting better! 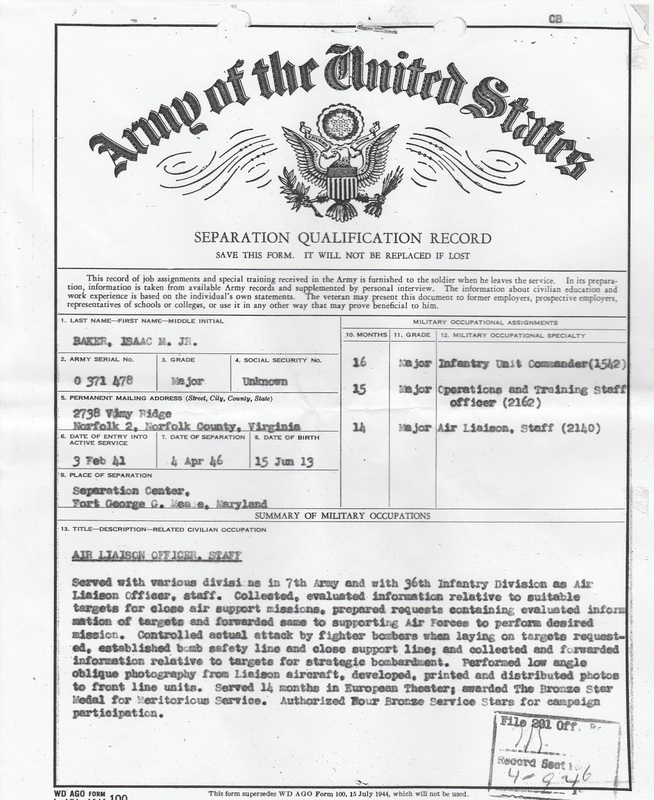 Lt Col Isaac M. B-A-K-E-R was born in 1913. 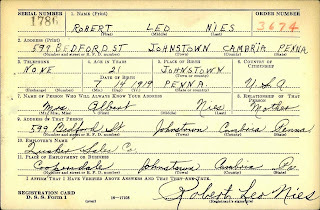 In 1931, at the young age of 17, he enlisted in Co K, 1st Virginia Infantry, 29th Division. 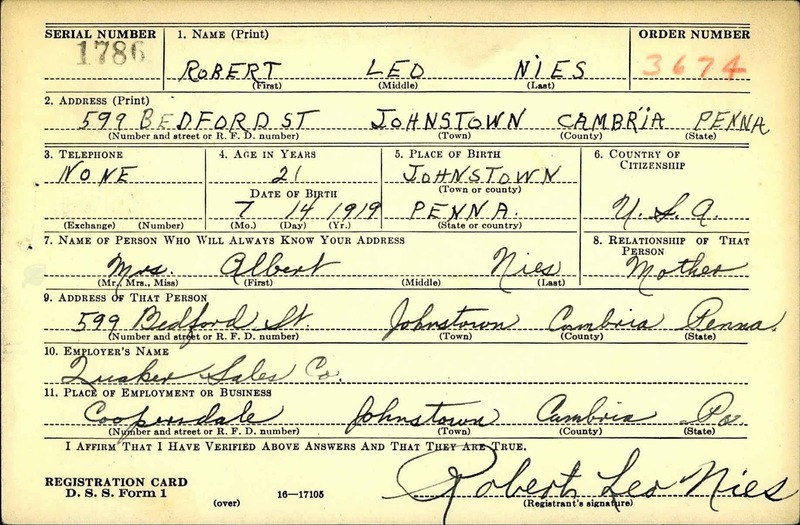 In 1938, he was commissioned as a Second Lieutenant in the 176th Infantry, 29th Division. He stayed with this Regiment (now separated from the 29th) throughout 1941, 1942, 1943, and 1944 rising to the rank of Major. 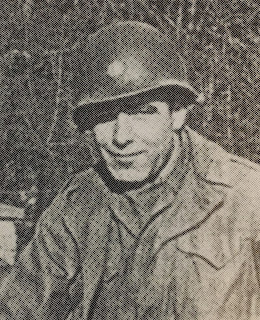 Biding his time stateside as a training Battalion Commander, he graduated Ground Liaison School in October of 1944 and was quickly shipped overseas to the 2689th Ground Liaison Detachment in the 5th Army. 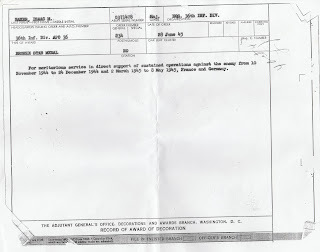 Upon completion of that assignment he was assigned to the HQ, 7th Army as the Air Liaison Officer. 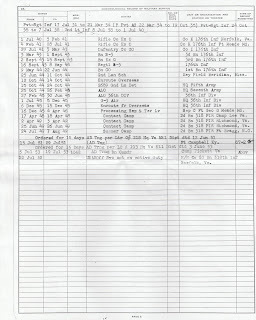 As an ALO, B-A-K-E-R collected and evaluated information about adversary targets and would recommend targets for Close Air Support missions AND strategic bombing campaigns by the Army Air Force. This man's job is especially near and dear to me as I am doing the same job 75 years later in the USAF as a targeting office. He would further the targeting process by controlling the actual attack by fighter bombers when laying munitions on to the target, establishing bomb safety/close support lines, and then further collected/forwarded information on to higher HQs. B-A-K-E-R would also perform low angle photography from Liaison A/C and distribute the images to front line troops. This man performed cradle to grave targeting, weaponeering, and intelligence dissemination! He would ultimately spend 14 months in the European Theater and was awarded the Bronze Star Medal for sustained direct support of combat Ops. He would also be awarded 4x Campaign Stars on his EAME ribbon. 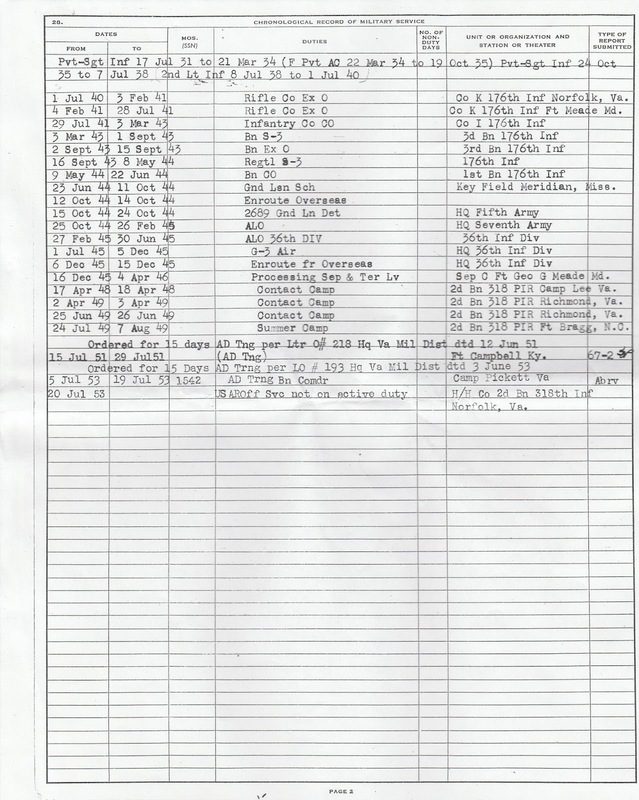 He organized a very successful mechanical contracting firm in Virginia and passed away in 1995 at the age of 82. 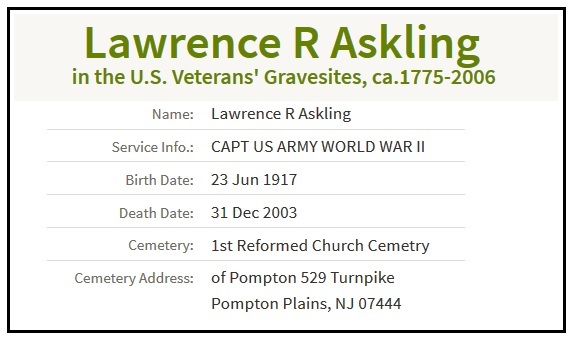 Capt Lawrence R. A-S-K-L-I-N-G was born on June 23, 1917 in Arlington, New Jersey. 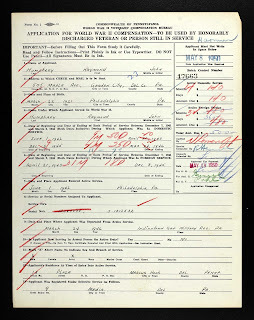 He enlisted in the Army on February 3, 1941. 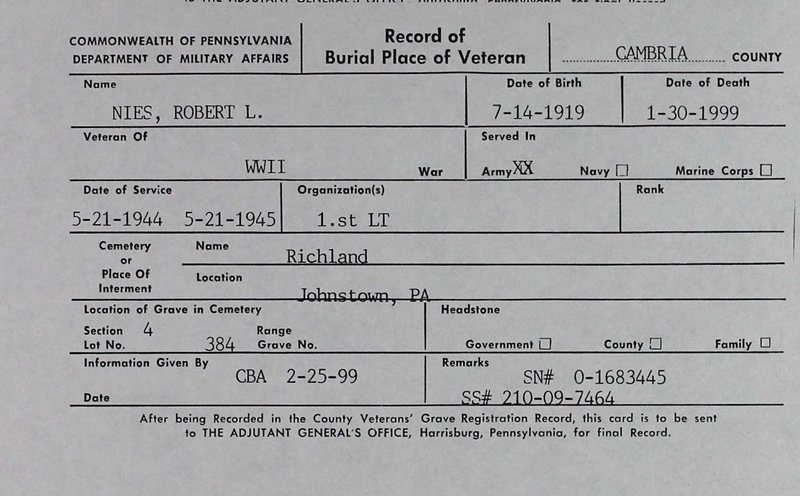 Assigned to Company B, 102nd Medical Regiment (later Battalion), he rose through the ranks and with 3 years of college under his belt, he was commissioned in 1942. 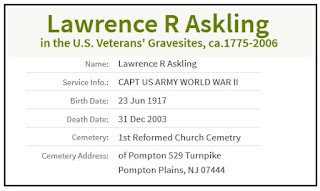 Rarely seen in today's military, Lt A-S-K-L-I-N-G stayed in the 102nd Medical Battalion as a Medical Administrative Officer. Deploying to the Pacific, The 27th Infantry Division first saw action in the attack and capture of Makin Atoll in the Gilbert Islands, 21 to 24 November 1943. One battalion of the 106th Regiment participated in the attack on Eniwetok Atoll, 19-26 February 1944, returning to Oahu in March. During this mission, one battalion landed unopposed on Majuro Island, 1 February, and completed its seizure, 3 February. The Division began preparations for the Marianas operations, 15 March. 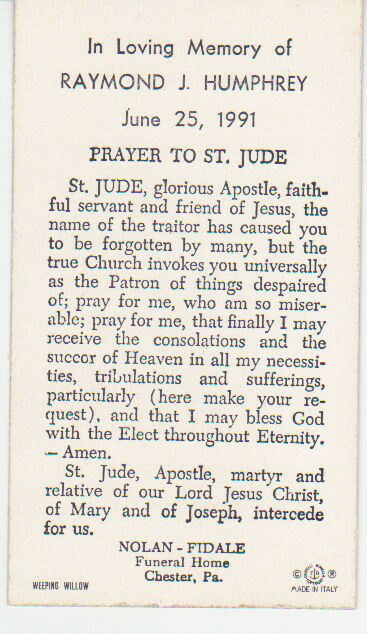 On D-day plus 1, 16 June 1944, elements landed at night on Saipan to support the Second and Fourth Marines. A bridgehead was established and Aslito Airfield captured, 18 June. Fighting continued throughout June. During a pitched battle, 7 July, Japanese overran elements of the Division in a banzai attack, but organized resistance was crushed the next day. During the months of July and August, the 27th cleaned out isolated pockets in the mountains and cliffs of Saipan. Beginning in the middle of August, the Division moved to the New Hebrides for rest and rehabilitation. 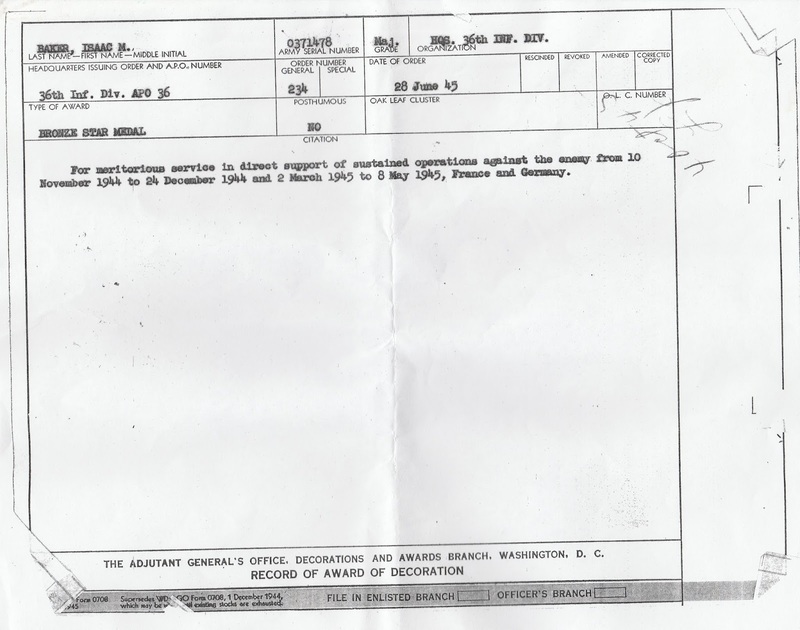 On 25 March 1945, the 27th sailed from Espiritu Santo, arriving at Okinawa, 9 April 1945. The Division participated in the XXIV Corps general attack, 19 April 1945, securing a dominating ridge line south of Machinato and Kakazu. Machinato Airfield was captured, 28 April, after a severe struggle. On 1 May, the Division was relieved by the 1st Marine Division and attached to the Island Command for garrison duty. Tori Shima was seized, 12 May, without opposition. The 27th attacked from the south end of Ishikawa Isthmus to sweep the northern sector of Okinawa. The enemy fought bitterly on Onnatake Hill from 23 May until 2 June, before losing the strong point. After a mopping-up period, the Division left Okinawa, 7 September 1945, moved to Japan and occupied Niigata and Fukushima Prefectures. The 102nd Medical Battalion received campaign stars for the Ryukyus and Western Pacific (Ground) Campaigns reflected on his Wolf Brown Ribbons. While the 102nd received assault credit, it is not displayed as an arrowhead on his uniform. 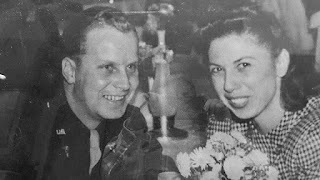 While on occupation duties in Japan, he met a beautiful Native American US nurse named Grace. Her story is also unique as she and her nursing classmates enlisted in 1943 and she served as a 1st Lieutenant (Army Nursing Corps) in North Africa, Italy, France and finally in Okinawa with the 106th Station Hospital. 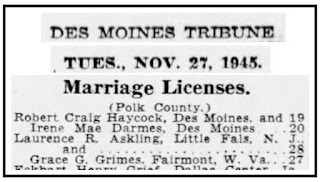 While serving her country, she fell in love with Captain A-S-K-L-I-N-G The day they were discharged in 1945 in Iowa, the two married. 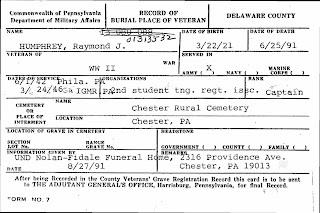 Lawrence worked at the telephone company after the war and passed away in 2003 in Pompton Plains, NJ. 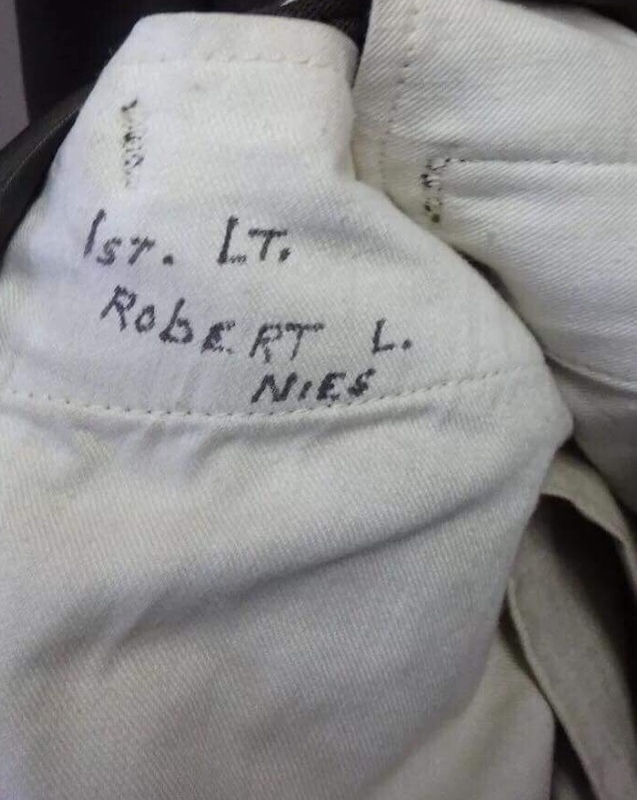 1st Lt Robert L N-I-E-S was born in 1919 in Johnstown, Pennsylvania. 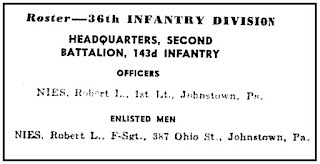 He enlisted in the Army on June 12, 1942 and upon completion of basic training, was assigned to the 2nd Bn Hq-Co, 143rd Infantry, 36th Division. 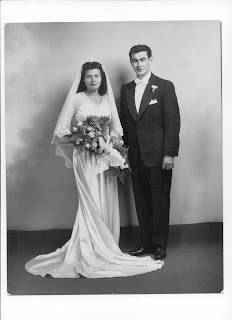 On 9 September 1943, he landed in Italy at Paestum in the Gulf of Salerno. 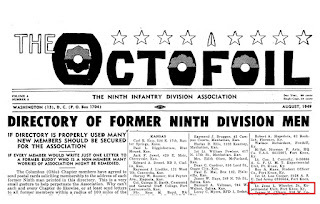 The 36th was the first American combat division to land on the continent of Europe. The Division fought in the Italian Campaign as part of the 5th United States Army in such notable actions as Mt. Lungo, San Pietro and the Rapido River. 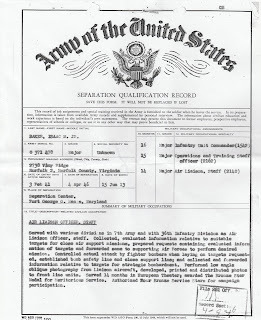 In the Rapido River action, the Division lost the better part of two of its three regiments - 141st and 143d - in unsuccessful attempts to cross the river. The attempted crossing was made to divert German troops from the landing of allied troops at Anzio. On 25 May 1944, the Division landed at Anzio and led the breakout toward Rome. The Division captured Velletri on 1 June 1944, and opened the gates of Rome for the 5th Army. The Division was then pulled out of Italy and landed on the beaches of Southern France on 15 August. Driving up through Southern France, the 36th was attacking and breaking the Siegfried Line when the war in Europe ended. 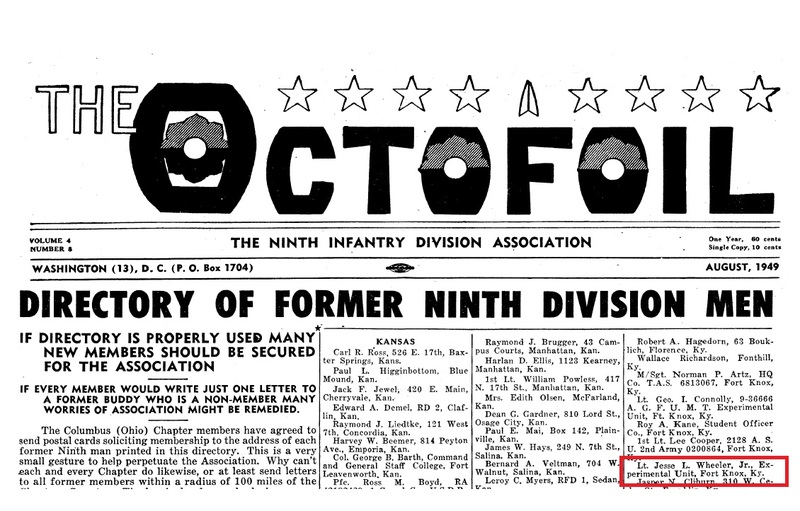 The 36th had spent 400 days in combat, accepted the surrender of Field Marshal Hermann Goering, won seven campaign streamers for its colors, taken part in two assault landings and 14 of its members had won the Medal of Honor. 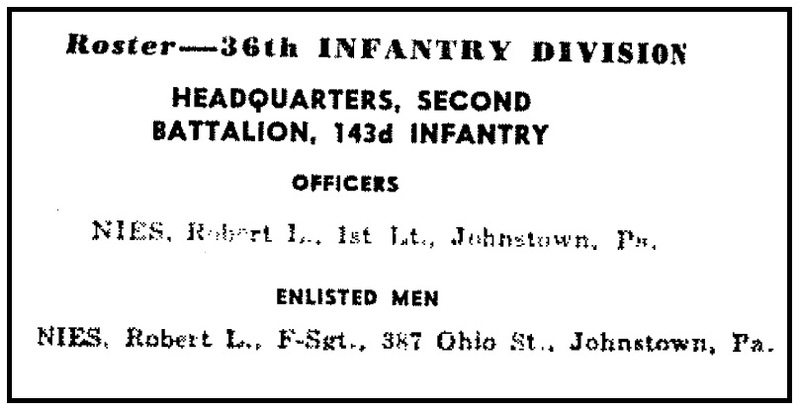 The Division had the ninth highest casualty rate of any Army Division in World War II. This uniform came right out of the veteran's estate and is 100% original. Interesting features are the 143d IR regimental crests and the rounded belt buckle (the jacket was made in 1945) He retains his Good Conduct Ribbon (which appears to outdate the other two ribbons) as a homage to his years rising through the ranks as an enlistedman. 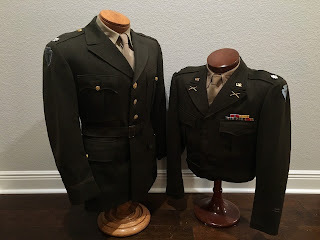 This uniform will be up for grabs and I want it to go to a 36th Div collection that will cherish it for years to come. 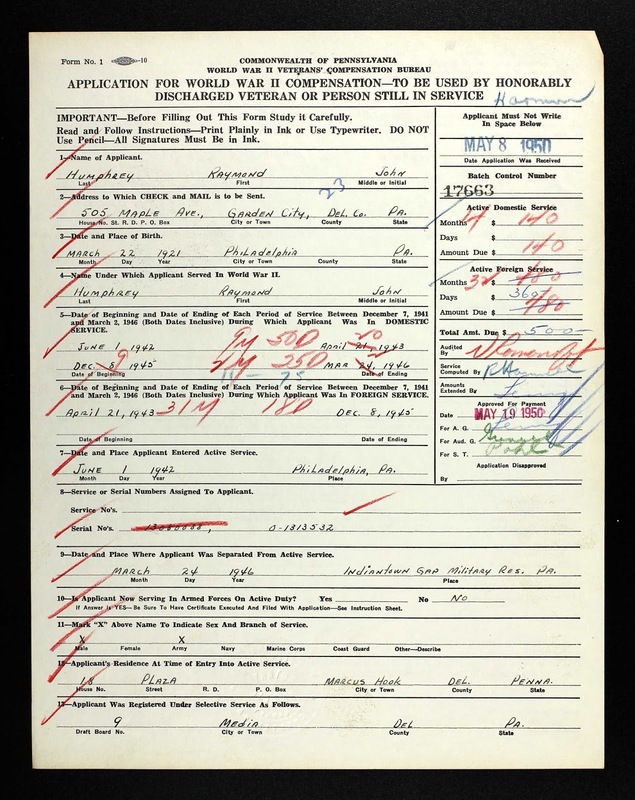 Providing historic military information to veteran's families and assisting United States military researchers, collectors, and hobbyists with veteran resources and item identification.